Christian Louboutin has just suffered a slip in his previously surefooted journey to protect his trademarked red soles, in this case against the house of Yves Saint Laurent. In an effort to stanch the flow of red dye onto the soles of competing YSL shoes, Louboutin not only filed a lawsuit back in April but also asked the court for a preliminary injunction against unauthorized use of his trademarked red soles. YSL fought back with references to red soles from Louis XIV's heels to Dorothy's ruby slippers to examples from its own archives, claiming that no cobbler can corner the market on red -- and that the Louboutin trademark is thus invalid. Today's decision from Judge Victor Marrero, while merely the denial of a preliminary injunction, fell decidedly on the side of YSL -- though the ultimate outcome of the case remains uncertain. And even were Louboutin's trademark to be canceled in the U.S., the red soles were declared "distinctive" and thus eligible for protection in Europe just two months ago. More significant from the perspective of fashion and intellectual property law is the analogy that guided the court's decision. Fashion designers often rely on trademark law for what little legal protection they have in the U.S., as patents are typically unattainable or impractical and copyright law specifically excludes fashion designs. Useful articles are categorically excluded from copyright protection, and the Copyright Office has consistently taken the position that articles of apparel are useful. 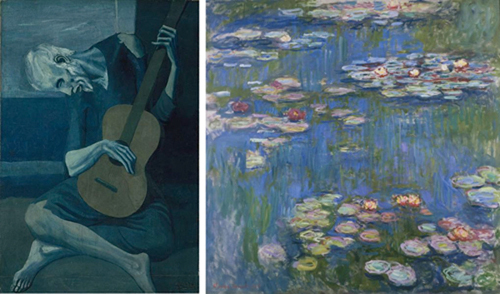 Judge Marrero, however, hung his order on the hypothetical example of Picasso attempting to prevent Monet from using the color blue in the Water Lilies series because the color had been Picasso's hallmark during his Blue Period. Unthinkable from an art history perspective, of course. The court acknowledges that no analogy is perfect -- but then goes on to claim that both painting and fashion design exist in the overlapping spheres of art and commerce, and that neither is well served by individual monopolies on color. Setting aside the troubling conflation of use of a red sole as a trademark versus use as a design element, the separation of which is the true challenge in this case, the court's analogy raises an essential question: Why are paintings characterized as "art" and entitled to full copyright protection while fashion receives almost none? This question captured my attention back when I was a law student, has informed a decade and a half of thought and research -- and will hopefully one day no longer be necessary. But in the meantime, Gucci should shelter its trademarked green-red-green stripes, and Tiffany had better watch its little blue boxes' backs. Copyright ©2005-2013 Susan Scafidi. Counterfeit Chic and its associated logo are trademarks of Susan Scafidi. Many thanks to my esteemed colleague Jeff Trexler for site design and maintenance. Obligatory disclaimer: Nothing on this site is legal advice, nor do I offer online legal advice or referrals.